The optimal long-term, symptomatic therapy for chronic shoulder pain has not been established. Accordingly, we investigated the outcomes of patients undergoing Hackett-Hemwall dextrose Prolotherapy treatment for unresolved shoulder pain at a charity clinic in rural Illinois. We studied a sample of 94 patients with an average of 53 months of unresolved shoulder pain that were treated quarterly with Prolotherapy. An average of 20 months following their last Prolotherapy session, patients were contacted and asked numerous questions in regard to their levels of pain and a variety of physical and psychological symptoms, as well as activities of daily living, before and after their last Prolotherapy treatment. The results of this study showed that patients had a statistically significant decline in their level of pain, stiffness, and crunching sensations (crepitation), to the p<.0000001 level with Prolotherapy, including the 39% of patients who were told by their medical doctors that there were no other treatment options for their pain and the twenty-one percent who were told that surgery was their only option. Over 82% of all patients experienced improvements in sleep, exercise ability, anxiety, depression, and overall disability with Prolotherapy. Ninety-seven percent of patients received pain relief with Prolotherapy. Conclusion: In this study, patients with chronic shoulder pain reported significant improvements in many clinically relevant parameters and overall quality of life after receiving Hackett-Hemwall dextrose Prolotherapy. George S. Hackett, MD, coined the term Prolotherapy.26 As he described it, “The treatment consists of the injection of a solution within the relaxed ligament and tendon which will stimulate the production of new fibrous tissue and bone cells that will strengthen the ‘weld’ of fibrous tissue and bone to stabilize the articulation and permanently eliminate the disability.”27 Animal studies have shown that Prolotherapy induces the production of new collagen by stimulating the normal inflammatory reaction.28, 29 In addition, animal studies have shown improvements in ligament and tendon diameter and strength.30, 31 Human studies have shown improvements in pain symptoms including those with chronic low back pain.32-35 Studies on the effectiveness of Prolotherapy on knee pain have been promising.36, 37 Though Prolotherapists routinely treat shoulder problems with Prolotherapy38, no studies have been published to date. To evaluate the effectiveness of Hackett-Hemwall dextrose Prolotherapy, not just on shoulder pain but on quality of life measures, this observational retrospective study was undertaken. Objective: To investigate the outcomes of patients undergoing Hackett-Hemwall dextrose Prolotherapy treatment for unresolved shoulder pain at a charity clinic in rural Illinois. Patients and Methods: Patients with unresolved shoulder pain treated with dextrose Prolotherapy every three months were included into an observational study. The patients were called on the phone and asked to answer detailed questions on the level of their shoulder pain, stiffness, range of motion, medication usage, anxiety, depression, activities of daily living, and other quality of life measures before and after receiving dextrose Prolotherapy. Results: Complete data was available on 94 shoulders who were treated during the years 2001-2005. The average starting shoulder pain level was 7.1 and ending shoulder pain level was 2.3. A matched sample paired t-test was used to calculate the difference in responses between the before and after measures for pain and stiffness for the 94 shoulder patients. The paired t-ratios for both pain and stiffness on the 94 shoulders were highly significant, using N pairs minus one as the degrees of freedom. For the entire 94 shoulder study participants the paired t-ratio was significant for pain relief at t(93)=-13.3 p<.0000001. In regard to stiffness, this also reached the highly statistically significant range with the paired t-ratio being t(93) = 15.77 p<.0000001. Range of motion improvement also reached statistical significance at t(93) = -13.13 p<.0000001. In the subgroup who were told surgery was their only option the paired t-ratio was significant for pain relief at t(19)=11.38 p<.0000001. For stiffness in the subgroup of patients told surgery was their only option the paired t-ratio was significant for stiffness relief at t(19)=5.85 p<.0000001. Shoulder range of motion showed the paired t-ratio as significant at t(19) = -8.82 p<.0000001. In patients told that no other treatment option existed, the results were also highly significant. In this subgroup of 37 patients, pain relief reached statistical significance with the paired t-ratio being t(36)=17.92 p<.0000001. For stiffness before and after Prolotherapy in this subgroup who were told there were no other treatment options, the paired t-ratio was also significant for stiffness at t(36)=10.31 p<.0000001 and for range of motion at t(36) = -10.82 p<.0000001. The percentage of patients that had improvements in their pain after treatment with Prolotherapy was 97%. The percentage of patients that were able to decrease their medication usage by 75% or more was 87%. More than 76% of patients were able to decrease their additional pain treatments by 75% or more. Anxiety and depression symptoms were present in 47% and 55% respectively before Prolotherapy and only in 12% and 19% respectively after Prolotherapy. While 62% of patients could exercise less than 30 minutes prior to Prolotherapy, this dropped to 22% after Prolotherapy. Ninety-seven percent of patients felt Prolotherapy improved their life overall. Conclusions: In this retrospective study, patients with an average of 53 months of chronic shoulder pain, even those whose medical doctors told them there was no other treatment for their pain or that surgery was their only option, reported clinically relevant improvements in their pain level and quality of life after receiving Hackett-Hemwall dextrose Prolotherapy. In October 1994 the primary authors (R.H., M.H.) started a Christian charity medical clinic called Beulah Land Natural Medicine Clinic in an impoverished area in southern Illinois. The primary modality of treatment offered was Prolotherapy for pain control. Dextrose was selected as the main ingredient in the Prolotherapy solution because of it being readily available, inexpensive (compared to other proliferants), and having a high safety profile. The clinic met every three months until July 2005. All treatments were given free of charge. Patients who received Prolotherapy for their unresolved shoulder pain in the years 2001 to 2005 were interviewed via telephone by an independent data collector (D.P.) who had no prior knowledge of Prolotherapy. General inclusion criteria were an age of at least 18 years, having an unresolved shoulder condition more than six months that typically responds to Prolotherapy, and a willingness to undergo at least four Prolotherapy sessions, unless the pain remitted with fewer Prolotherapy sessions. The Hackett-Hemwall technique of Prolotherapy was used. Each patient received 20 to 40 injections with a 15% dextrose, 0.2% lidocaine solution for a total of 20 to 30cc of solution used per shoulder. Each patient was given an intraarticular injection of 5 to 10cc of solution. Around the shoulder, tender areas were also injected, and 0.5 to 1cc of solution was used per extra-articular injection. (See Figure 1.) Tender areas injected on the anterior and superior portions of the shoulder could include the acromioclavicular joint and ligaments, rotator cuff tendon attachments, coracoacromial ligaments, as well as the biceps tendons and glenohumeral ligament attachments. No other therapies were used. As much as the pain would allow, the patients were asked to reduce or stop nonsteroidal anti-inflammatory and narcotic medications. Figure 1. Prolotherapy to the shoulder. 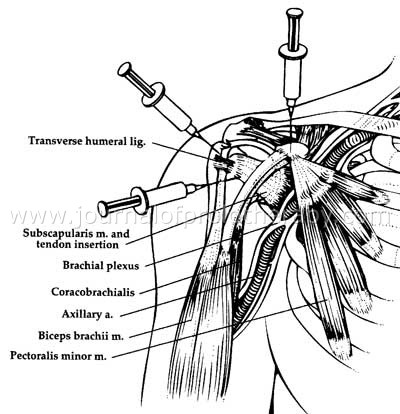 Injection sites to the shoulder are demonstrated, including the coracoid process, subscapularis tendon, and the greater tuberosity. The independent data collector (D.P.) was the sole person obtaining the patient information during the telephone interviews. The patients were asked a series of questions about their pain and previous treatments before starting Prolotherapy. Their response to Prolotherapy was also detailed with an emphasis on the effect Prolotherapy had on their need for subsequent treatments and their quality of life. Specifically, patients were asked questions concerning years of pain, pain intensity, overall disability, number of physicians seen and medications taken, quality of life concerns, psychological factors, and whether the response to Prolotherapy continued after the Prolotherapy sessions were finished. For the analysis, patient percentages of the various responses were calculated by another independent person (D.G.) who had no prior knowledge of Prolotherapy. These responses gathered from clients before Prolotherapy were then compared with the responses to the same questions after Prolotherapy. A matched sample t-test was used to determine if there were statistically significant improvements in the before and after Prolotherapy measurements for pain, stiffness, and crunching sensations. Further analyses were done with those patients who stated their medical doctors said that surgery was their only option or that there were no other treatment options for their pain. From a total of 122 patients with unresolved shoulder pain whose charts were analyzed and who were interviewed via telephone, 94 met the inclusion criteria. The main reasons for exclusion were inability to come for treatments primarily due to travel/distance (42%), stopped treatments because of their medical doctor’s recommendation (i.e. needed treatments more frequently or other medical problems) or on their own (31%), inability or unwillingness to answer survey (16%), and other (11%). Table 1. Demographics of the shoulder patient population. Patients received an average of 3.8 Prolotherapy treatments per shoulder. The average time of follow-up after their last Prolotherapy session was 20 months. Patients were asked to rate their pain, stiffness, and crunching sensation on a scale of 1 to 10. With 1 being no pain/stiffness/crunching and 10 being severe/crippling pain/stiffness/crunching. The 94 shoulders had an average starting pain level of 7.1, starting stiffness level of 5.4, and starting crunching level of 3.9. Patients were asked to rate their mobility on a scale of 1 to 7, with 1 being no motion, 2 through 5 were percentages of normal motion with 2 being 1-24%, 3 being 25-49%, 4 being 50-74% and 5 being 75-99% of normal motion. Normal motion was 6, and 7 was excessive motion or hypermobility. The average starting mobility level was 3.7. 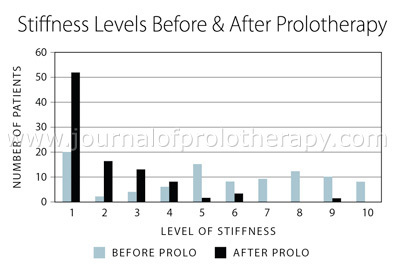 The patients reported that their ending pain level after Prolotherapy was 2.3, ending mobility 5.2, ending stiffness 2.0, and ending crunching 1.9. Eighty-eight percent started with greater than serious pain (5 or more) but after Prolotherapy only 9.6% had that much pain. The percentage of patients who had a decrease in their pain level was 97%. (See Figure 2.) More than 86% of patients had minimal stiffness when finished with treatments, but only 28% started with it. (See Figure 3.) Ninety-seven percent of patients finished with 50% or greater of normal motion, whereas, prior to Prolotherapy only 58% had that amount of motion. Seventy percent of patients who were on prescription pain medications were able to stop taking them after Prolotherapy. Another 17% were able to decrease the amount needed by 75% or more. No patient had to increase their pain medication usage since receiving Prolotherapy. Sixty-six percent of the patients receiving other pain management care were able to stop after Prolotherapy. Another 10% were able to decrease it by 75% or more. Figure 2. Pain levels before and after Hackett-Hemwall dextrose Prolotherapy in 94 shoulders. Figure 3. Stiffness levels before and after Hackett-Hemwall dextrose Prolotherapy in 94 shoulders. Figure 4. Improvement in overall disability before and after Hackett-Hemwall dextrose Prolotherapy. Figure 5. Improvement in athletic ability before and after Hackett-Hemwall dextrose Prolotherapy. Before Prolotherapy, 47% considered themselves having some depression and 55% had some anxiety but after Prolotherapy this decreased to 12% and 19%, respectively after Prolotherapy. (See Figure 6.) Three patients were on medications for depression and two other patients were on anxiety medications before Prolotherapy, but after treatment all five were able to stop taking their medications. Ninety-one percent of patients who started with depressed feelings and 75% of those with anxiety were improved at the time of follow-up. In regard to sleep, 80% said that their shoulder pain affected their ability to sleep before Prolotherapy. After Prolotherapy, 88% could sleep much better. Figure 6. Depression levels before and after receiving Hackett-Hemwall dextrose Prolotherapy. To a simple yes or no question: “Has Prolotherapy changed your life for the better?” 97% of patients treated answered “yes.” In quantifying the response, 49% felt their life was at least radically better with 67% noting that they were very much better with Prolotherapy, but 99% rated their condition as at least somewhat better. 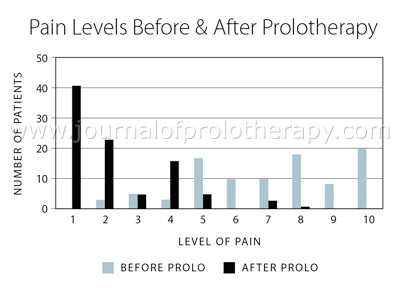 Eighty-seven percent rated Prolotherapy as at least very successful in treating their condition (50% or greater pain improvement) with 56% noting the Prolotherapy to be extremely successful (75% or greater pain improvement). The average person in this study was 20 months out since their last Prolotherapy session. The patients were asked if the improvement with Prolotherapy lasted, and how much of the effect remained. In regard to pain, for instance, 68% noted that 100% of the improvement continued to this day, with 88% stating that at least 50% of the effect remained. Eighty-five percent of patients stated that the overall results of Prolotherapy has mostly continued (50% or greater). A summary of the lasting effects of Prolotherapy on the various quality of life measures is seen in Table 2. Table 2. Lasting improvements with Hackett-Hemwall dextrose Prolotherapy in shoulder pain patients. On average 20 months following their last Prolotherapy session, patients reported continued improvements in pain, stiffness, athletic ability, and overall disability. Patients were asked the question, “Are there reasons besides the Prolotherapy effect wearing off that are causing your pain/disability?” Eighty-two percent with continued pain answered “Yes.” Forty-three percent believed they stopped Prolotherapy too soon (before pain was totally gone), 21% had other medical reasons/conditions for their pain, 18% re-injured the area that had received Prolotherapy, 11% had a new area of pain, and 6% had increased life stressors. Of the clients whose pain increased for the above reasons after Prolotherapy was stopped, 80% are planning on receiving more Prolotherapy. 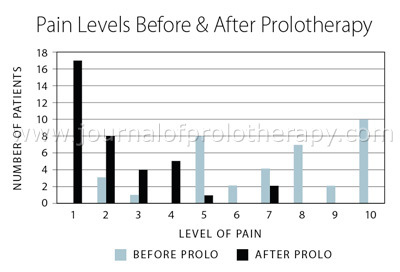 Overall 97% of patients showed improvement in their pain with Prolotherapy. Eighty-six percent of patients treated considered the Prolotherapy treatment to be very successful (greater than 50% pain relief). In regard to the question “Has Prolotherapy changed your life for the better?” 97% answered “Yes.” Ninety-two percent knew someone who has benefited from Prolotherapy. Ninety-seven percent have recommended it to someone. A matched sample paired t-test was used to calculate the difference in responses between the before and after measures for pain, stiffness, and crunching. Using the matched sample t-test on all three variables, all p values reached statistical significance at the p<.0000001 level. As previously noted, 39% of patients prior to Prolotherapy were told that there were no other treatment options for their pain. They had seen an average 3.3 medical doctors for their pain which they had experienced for an average of 5.1 years. In analyzing just these patients, their before and after Prolotherapy values for pain, range of motion, stiffness and crunching can be seen in Table 3. All reached statistical significance to at least the p<.0000001 level. Table 3. Before and after Prolotherapy statistics on shoulder patients told by their MD’s that no other treatment options were available. The starting and ending pain levels for these patients can be seen in Figure 7. Eighty-one percent of these patients had greater than 50% pain relief. Eighty-nine percent of them ended with greater than 75% of normal motion after Prolotherapy, whereas prior to it only 27% had that amount of motion. In regard to exercise ability, only 17% could exercise more than 30 minutes before Prolotherapy but after Prolotherapy this increased to 46%. Figure 7. Pain levels before and after Hackett-Hemwall dextrose Prolotherapy in shoulder patients who were told that no other treatment options were available. As a group, prior to Prolotherapy they were taking on average 1.3 pain medications, but after Prolotherapy only 0.4 pain medications. Twelve of these patients had completely stopped their pain medications after Prolotherapy. As of the follow-up, 25 of the patients were taking no medications and 12 were taking one pain medication, whereas prior to Prolotherapy 14 of the patients were taking two or more pain medications. Before receiving Prolotherapy, 57% experienced some depressed feelings, but after Prolotherapy, this dropped to 14%. The three patients on medications for depression were able stop taking them after Prolotherapy. Fifty-nine percent of patients had some anxious thoughts prior to Prolotherapy, but after Prolotherapy only 27%. The two patients that were taking medications for anxiety were able discontinue them. Ninety-five percent of these patients knew someone who benefited from Prolotherapy and an equal number recommended it to someone. Ninety-seven percent of this subgroup felt that the Prolotherapy changed their lives for the better. Twenty-one percent of patients, prior to Prolotherapy, were told by their physician that surgery was their only option. As a group, they had seen an average of 3.4 physicians for their pain which they had experienced on average for 53 months. This group of patients’ before and after values for pain, stiffness and crunching with Prolotherapy can be seen in Table 4. All reached statistical significance to the p<.0000001 level. Table 4. Before and after Prolotherapy statistics on shoulder patients told by their MD’s that surgery was their only option. The starting and ending pain levels for all of these patients can be seen in Table 4. Ninety percent of these patients experienced greater than 50% pain relief. Fifty-five percent experienced greater than 75% pain relief. Ninety percent of them ended with greater than 75% of normal motion after Prolotherapy, whereas prior to Prolotherapy, only 15% possessed that amount of motion. Prior to Prolotherapy the patients were taking on average 1.5 pain medications, but after Prolotherapy only 0.4 medications. Nine of these patients had totally stopped their pain medications that they were taking prior to Prolotherapy. Twenty months on average after their last Prolotherapy session, 13 were on no medications and seven were taking one pain medication, whereas prior to Prolotherapy nine of the patients were taking two or more pain medications. Before receiving Prolotherapy, 50% felt they had some depressed feelings but after Prolotherapy it was down to only 15%. Fifty-nine percent of patients felt some anxiety prior to Prolotherapy but afterwards only 10%. In regard to exercise, 85% said they could exercise less than 30 minutes per day using the affected shoulder before Prolotherapy, but after Prolotherapy only 20% were so limited. Ninety percent of the patients said Prolotherapy helped them sleep better. In regard to work situation, two of these patients who were completely disabled were able to get back to work because of Prolotherapy. Ninety-five percent of these patients knew someone who has benefited from Prolotherapy and an equal number had recommended it to someone. Ninety-five percent also felt that the Prolotherapy changed their lives for the better. Table 5. Summary of results of Hackett-Hemwall dextrose Prolotherapy shoulder study. Our study cannot be compared to a clinical trial in which an intervention is investigated under controlled conditions. Instead, it’s aimed to document the response of patients with unresolved shoulder pain to the Hackett-Hemwall technique of dextrose Prolotherapy at a charity medical clinic. Clear strengths of the study are the numerous quality of life parameters that were studied. Quality of life issues such as overall disability, stiffness, range of motion, activities of daily living, athletic (exercise) ability, anxiety and depression, in addition to pain level, are important factors affecting the person with unresolved shoulder pain. Decreases in medication usage and additional pain management care were also documented. The improvement in such a large number of shoulders, treated solely by Prolotherapy, is likely to have resulted from Prolotherapy, especially when 61% of the patients were either told by their medical doctors that there was no other treatment for their pain or that surgery was their only option. Another strength is that many of the above parameters are objective. So while there is no one hundred percent definitive medical test to document pain improvement or the progress with Prolotherapy, an increased ability to exercise, have more range of motion and use less medications and other pain therapies are objective changes. The quality of the cases treated in this study is also a strength. The average person in this study had unresolved shoulder pain for four years, eleven months and had seen over three physicians already. As noted earlier, fifty-seven (61%) of the patients were either told by their MD(s) that there was no other treatment option for their pain or that surgery was their only option. So clearly this patient population represented chronic unresponsive shoulder pain. Having a follow-up time on average of twenty months since their last Prolotherapy session also was a strength, because chronic joint pain typically doesn’t just spontaneously remit. The normal course is actually the opposite, progressively worse pain. So for this group of patients to have such a drastic improvement in their pain and for that improvement to last, gives credence to the notion that the improvement is from the Prolotherapy itself. Because this was a charity medical clinic with limited resources and personnel, the only therapy that was used was Prolotherapy. The Prolotherapy treatments could only be given every three months. In private practice, the Hackett-Hemwall technique of dextrose Prolotherapy is typically given every four to six weeks. If a patient is not improving or has poor healing ability, the Prolotherapy solutions may be changed and strengthened or the patient is advised on additional measures to improve their overall health. This can include advice on diet, supplements, exercise, weight loss, changes in medications, additional blood tests, and/or other medical care. Often patients are weaned immediately off of anti-inflammatory and narcotic medications that inhibit the inflammatory response that is needed to get a healing effect from Prolotherapy. Since this was not done in this study, the results at this charity clinic are an indication of the lowest level of success with Hackett-Hemwall dextrose Prolotherapy. This makes the results even that much more impressive. A shortcoming of our study is the subjective nature of some of the evaluated parameters. Subjective parameters of this sort included pain, stiffness, anxiety, and depression levels. The results relied on the answers to questions by the patients. Another shortcoming is the additional pain management care that they were receiving was not controlled. What was documented was the change that occurred in it with Prolotherapy. There was also a lack of X-ray and MRI correlation for diagnosis and response to treatment. A lack of physical examination documentation in the patients’ chart made categorization of the patients into various diagnostic parameters impossible. Musculoskeletal disorders of the shoulder are extremely common, with reports of prevalence ranging from one in three people experiencing shoulder pain at some stage of their lives to approximately half the population experiencing at least one episode of shoulder pain annually.39 Hackett-Hemwall dextrose Prolotherapy was shown to be very effective in eliminating pain and improving the quality of life in this group of patients with chronic shoulder pain. This included the subgroup of patients that were told by their physicians that there were no other treatment options for their pain or that surgery was their only option. One of the treatments that chronic pain sufferers are using instead of surgery and conventional pain medications including narcotics is Prolotherapy.60, 61 Prolotherapy works by stimulating the body to repair these soft tissue structures. It starts and accelerates the inflammatory healing cascade by which fibroblasts proliferate. Fibroblasts are the cells through which collagen is made and by which ligaments and tendons repair. For those patients suffering from chronic shoulder pain, histologic and MRI studies have shown that the pathophysiology is one of rotator cuff degeneration, not inflammation.62-64 In other words, chronic shoulder pain comes from tendon degeneration, in which collagen content within the tendon substance is either missing or changed.65, 66 Since Prolotherapy is the injection of a solution for the purpose of tightening and strengthening weak tendons, ligaments or other structures involved in the stability and movement of a joint, it would be expected to be successful for those suffering from chronic shoulder pain. The Hackett-Hemwall technique of dextrose Prolotherapy used on patients who had an average duration of four years, eleven months of unresolved shoulder pain who were twenty months out from their last Prolotherapy session was shown in this observational study to improve their quality of life. They reported less pain, stiffness, crunching sensation, disability, depressed and anxious thoughts, medication and other pain therapy usage, as well as improved range of motion, sleep, exercise ability, and activities of daily living. This included patients who were told there were no other treatment options for their pain or that surgery was their only option. Therefore, Hackett-Hemwall dextrose Prolotherapy is a treatment that should be highly considered for people suffering with unresolved shoulder pain. More information and updated information is available on Rotator Cuff Surgery. Bot SD, et al. Incidence and prevalence of complaints of the neck and upper extremity in general practice. Annals of Rheumatic Diseases. 2005;64:118-123. Chard MD, et al. Shoulder disorders in the elderly: a community survey. Arthritis and Rheumatism. 1991;34:766-769. Juul-Kristensen B, et al. Computer users’ risk factors for developing shoulder, elbow and back symptoms. Scan J Work Environ Health. 2004;30:390-398. Hakala P, et al. Back, neck, and shoulder pain in Finnish adolescents: national cross sectional surveys. British Medical Journal. 2002;325:743-749. Van der Windt DA, et al. Shoulder disorders in general practice: incidence, patient characteristics and management. Annals of Rheumatic Diseases. 1995;54:959-964. Sheeler R. Alternative treatments: Dealing with chronic pain. Mayo Clinic Health Letter. April 2005. 23(4). Karjalainen K. Multidisciplinary biopsychosocial rehabilitation for neck and shoulder pain among working age adults. Cochrane Review Abstracts. http://www.medscape.com/viewarticle/486092, pages 1-2. Garfinkel M. Yoga as a complementary therapy. Geriatrics Aging. 2006;9:190-4. Green S. Physiotherapy interventions for shoulder pain. Cochrane Review Abstracts. http://www.medscape.com/viewarticle/486953, pages 1-3. Green S. Systematic review of randomized controlled trials of interventions for painful shoulder: selection criteria, outcome assessment, and efficacy. BMJ. 1998;316:354-360. Abstract. Lennard T. Pain Procedures in Clinical Practice. Second Edition. Philadelphia, PA: Hanley & Belfus, Inc., 2000. Lennard T. Physiatric Procedures in Clinical Practice. Philadelphia, PA: Hanley & Belfus, Inc., 1995. Hauser R., et al. Prolo Your Pain Away! Second Edition. Oak Park, IL, Beulah Land Press, 2004. Dorman, Thomas. Prolotherapy in the Lumbar Spine and Pelvis. Philadelphia, PA: Hanley & Belfus, Inc., 1995. Hackett G, et al. Ligament and Tendon Relaxation Treated by Prolotherapy, 5th ed. Oak Park, IL, Gustav A. Hemwall, 1992. Reeves KD. Prolotherapy: Present and future applications in soft tissue pain and disability. Phys Med Rehabil Clin North Am. 6:917-926,1995. Ongley M. Ligament instability of knees: a new approach to treatment. Manual Medicine. 1988;3:152-154. Hackett, G. Prolotherapy in whiplash and low back pain. Postgrad Med. 1960;27:214-219. Kayfetz D. Occipital-cervical (whiplash) injuries treated by Prolotherapy. Medical Trial Technique Quarterly. 1963; June:9-29. Klein R. A randomized double-blind trial of dextrose-glycerine-phenol injections for chronic, low back pain. Journal of Spinal Disorders. 1993;6:23-33. Reeves K, et al. Randomized, prospective, placebo-controlled double-blind study of dextrose Prolotherapy for osteoarthrtic thumb and finger joints: evidence of clinical efficacy. Journal of Alternative and Complementary Medicine. 2000,6:311-320. Yelland M. Prolotherapy injections, saline injections, and exercises for chronic low back pain: A randomized trial. Spine. 2004;29(1):9-16. Brolinson G. Prolotherapy: Cutting edge therapy for chronic injuries? ACC Sports Sciences Main Page. 2005, June:1-3. Schwartz R. Prolotherapy: A literature review and retrospective study. Journal of Neurology, Orthopedic Medicine and Surgery. 1991; 12:220-223. Schmidt H. Effect of growth factors on proliferation of fibroblasts from the medical collateral and anterior cruciate ligaments. Journal of Orthopaedic Research. 1995;13:184-190. Liu Y. An in situ study of the influence of a sclerosing solution in rabbit medical collateral ligaments and its junction strength. Connective Tissue Research. 1983;2:95-102. Maynard J. Morphological and biomechanical effects of sodium morrhuate on tendons. Journal of Orthopaedic Research. 1985;3:236-248. Hackett G. Prolotherapy for headache. Headache. 1962; April: 3-11. Hackett G. Low back pain. The British Journal of Physical Medicine. 1956;19:25-35. Ongley M. A new approach to the treatment of chronic low back pain. Lancet. 1987;2:143-147. Reeves K, et al. Randomized, prospective double-blind placebo-controlled study of dextrose Prolotherapy for knee osteoarthritis with or without ACL laxity. Alternative Therapies. 2000;6:311-320. Ongley M, et al. Ligament instability of knees: A new approach to treatment. Manual Medicine. 1988;3:152-154. Lewis JS. Rotator cuff tendinopathy. British Journal of Sports Medicine. 2009;43:236-241. Harryman DT, et al. Repairs of the rotator cuff: correlation of functional results with integrity of the cuff. Journal of Bone and Joint Surgery America. 1991;73:982-989. Hambly N, et al. Rotator cuff impingement: correlation between findings on MRI and outcome after fluoroscopically guided subacromial bursography and steroid injection. American Journal of Roentgenology. 2007;189:1179-1184. Sher JS, et al. Abnormal findings on magnetic resonance images of asymptomatic shoulders. Journal of Bone and Joint America. 1995; 77:10-15. Burkhead WZ, et al. The rotator cuff: debridement versus repair – part II. Contemporary Orthopedics. 1995;31:313-326. Rothman RH, et al. The vascular anatomy of the rotator cuff. Clinical Orthopedics and Related Research. 1965;41:176-186. Lohr JF, et al. The microvascular pattern of the supraspinatus tendon. Clinical Orthopedics and Related Research. 1990;254:35-38. Matsen FA, et al. Rotator cuff. In: Rockwood CA, Matsen FA, eds. The Shoulder. Philadelphia PA: WB Saunders; 1998:775-839. Mantone J. Nonoperative treatment of rotator cuff tears. Orthop Clin North Am. 2000;31:295-311. Barclay L. Surgery, exercise therapy have similar outcomes for rotator cuff impingment. Medscape Medical News. May, 23, 2005. http://www.medscape.com/viewarticle/505303. Pages 1-3. Berry H, et al. Clinical study comparing acupuncture, physiotherapy, injection and oral anti-inflammatory therapy in shoulder-cuff lesions. Curr Med Res Opin. 1980;7:121-126. Abstract. Edwards S. NSAIDs and physical therapy effective for superior labral tears. Presented AT the American Orthopaedic Society for Sports Medicine 2007 Meeting, Calgary, Alberta. July 2007. Matsen F. Glenohumeral arthritis and its management. In: Rockwood CA, Matsen F. The Shoulder, Volumes 1 & 11. Philadelphia: WB Saunders, Co; 1990. Taheriazam A, et al. Outcome predictors in non operative management of newly diagnosed subacromial impingement syndrome: a longitudinal study. Medscape General Medicine. 2005; 7:63-71. www.medscape.com/viewarticle/496632_print. Bokor DJ, et al. Results of non operative management of full-thickness tears of the rotator cuff. Clin Orthop. 1993;78:229-232. Jost B. Clinical outcome after structural failure of rotator cuff repairs. J Bone Joint Surg Am. 2000;82:304-314. Fadale P, et al. Corticosteroid injections: their use and abuse. J Am Acad Orthop Surg. 1994;2:133-140. Neer C, et al. Recent experience in total shoulder replacement. J Bone Joint Surg Am. 1982;64:19-337. Codd T, et al. Prosthetic replacement in the rotator cuff-deficient shoulder. Techniques Orthop. 1994;8:174-183. Skirving A. Total shoulder arthroplasty – current problems and possible solutions. J Orthop Sci. 1999;4:42-53. Fleming S, et al. CAM therapies among primary care patients using opioid therapy for chronic pain. BMJ Complent Altern Med. 2007 May 16;7(1):15-17. Hauser R, et al. Prolo Your Arthritis Pain Away! Beulah Land Press, Oak Park, IL, 2001. Nho S, et al. Rotator cuff degeneration: etiology and pathogenesis. American Journal of Sports Medicine. 2008;36:987-993. Millar NL, et al. Cytokines and apoptosis in supraspinatus tendinopathy. Journal of Bone and Joint Surgery, Britain. 2009; 91:417-424. Sein ML, et al. Reliability of MRI assessment of supraspinatus tendinopathy. Br J Sports Med. 2007;41:8 e9. Riley GP, et al. Tendon degeneration and chronic shoulder pain: changes in the collagen composition of the human rotator cuff tendons in rotator cuff tendinitis. Annals of Rheumatic Diseases. 1994;53:359-366. Cotton RE, et al. Tears of the humeral rotator cuff: a radiological and pathological necropsy survey. Journal of Bone and Joint Surgery Britain. 1964;46:314-328.